Consumers take action nowï¿½to protect their privacy and civil liberties before itï¿½s too late. RFID, which stands for Radio Frequency IDentification, is a technology that uses computer chips smaller than a grain of sand to track items from a distance. And as this mind-blowing book explains, plans and efforts are being made now by global corporations and the U.S government to turn this advanced technology, these spychips, into a way to track our daily activitiesï¿½and keep us all on Big Brotherï¿½s short leash. 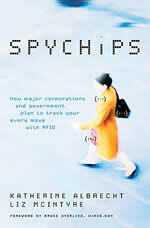 Compiling massive amounts of research with firsthand knowledge, Spychips explains RFID technology and reveals the history and future of the master plannersï¿½ strategies to imbed these trackers on everythingï¿½from postage stamps to shoes to people themselvesï¿½and spy on Americans without our knowledge or consent. It also urgently encourages consumers to take action nowï¿½to protect their privacy and civil liberties before itï¿½s too late.